Seated, swing both legs out in front of you. Sit up tall, pressing into both of your sit bones evenly. Lengthen the spine and relax your shoulders. Hug the left knee into your chest. Press the sole of the left foot into the inside of your right leg and let the left knee open to the side. Keep the right foot flexed, but avoid locking your right knee. If needed, place a rolled up blanket under your knee. Take a deep inhale, then exhale to walk your hands toward your foot. If you can't touch your toes, that's okay. If you can't touch your nose to your knee, that's okay too. 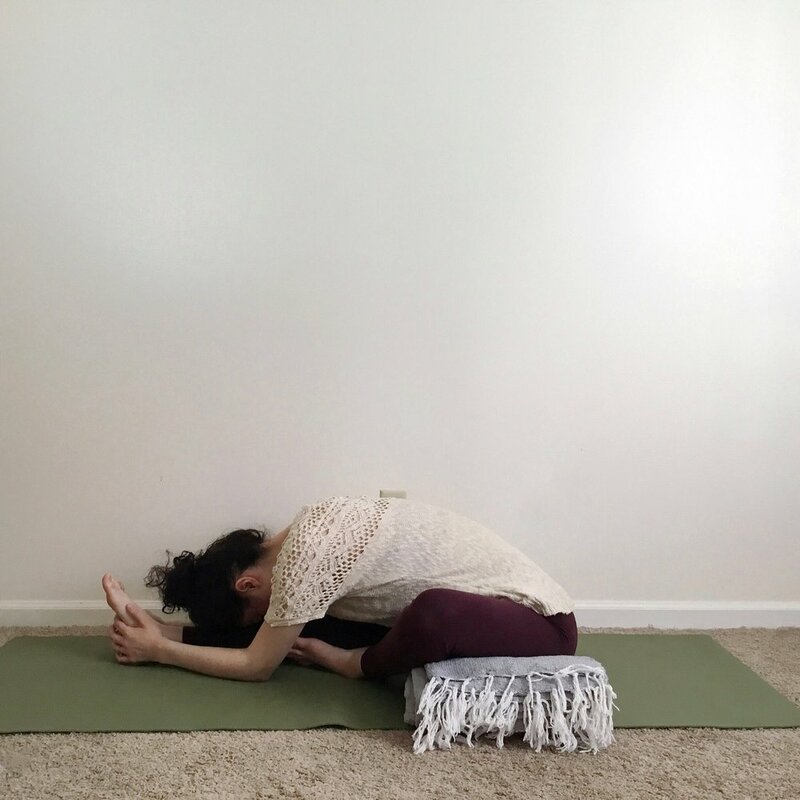 It can be deeply relaxing to rest the head in this pose, so if it doesn't reach your leg, try one of the following modification ideas. Hold for ten deep breaths, and then practice on the opposite side. Adding a folded blanket underneath your sit bones tilts the pelvis forward slightly. Some people may find that this gives them more freedom to fold forward. You could also try a cushion, pillow or yoga block. Play around with the height to find what feels the best. Snuggle a folded blanket or a pillow underneath your bent knee, as close as you can get it to your hip. This is going to minimize the inner thigh and hip stretch, which might make it more comfortable for you to fold forward. You can rest your forehead on top of a bolster or a yoga block. You might find that one side of your body is more open than the other, so you might need to adjust the height of your props when you switch sides. For this seated variation, you'll sit at the edge of your chair with the feet flat on the floor. Lift the left foot and place the outer edge of the foot on a block or you can cross the left ankle over the right knee. Hold for ten deep breaths, then practice on the opposite side. This variation is a play on Viparita Karani (Legs Up the Wall Pose). You'll come into this variation the same way you would Viparita Karani, only you're going to create the Janu Sirsasana shape with your legs. This is going to allow you to experience the same stretch without being upright and without folding forward. This may be a better option for people with severe low back pain, vertigo, or especially tight hips. It may appear that you're just lying there, but savasana is arguably the MOST important yoga posture of all. 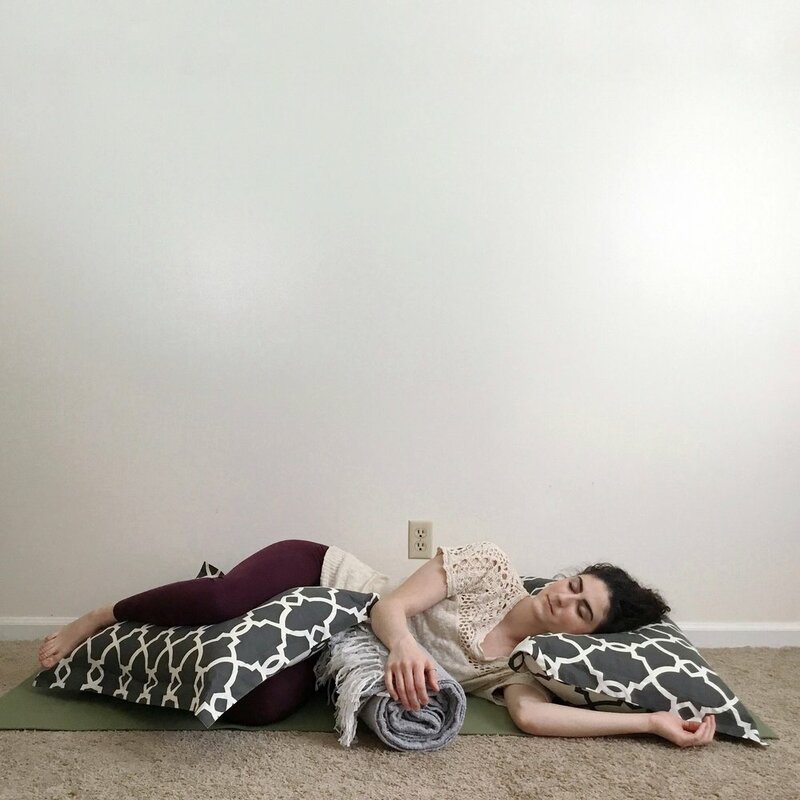 Savasana is typically done at the end of our yoga practices, and this is because savasana allows the mind and body to integrate all of the work you did throughout your practice. Yoga builds and circulates prana (life-force energy) and when you rest in savasana, you allow this prana to permeate your entbody. Lie on your back. Make sure that the shoulders are in line with your hips. The feet are at least hip distance apart (or wider) with the feet relaxed and flopping open to the sides. Scoop the shoulder blades back so that they're away from your ears and pressing evenly into the mat. The arms are resting alongside your body with the palms facing up. This is a position of deep surrender and rest. Tuck the chin slightly to create length in the back of your neck. The eyes can be open or closed. Hold this pose for up to twenty minutes or even longer, depending on your practice. This pose can be uncomfortable for people with lower back pain. Adding a bolster or a pillow under the knees can help to alleviate this discomfort. You can also add a pillow or yoga block underneath the head to help create length in the back of your neck. 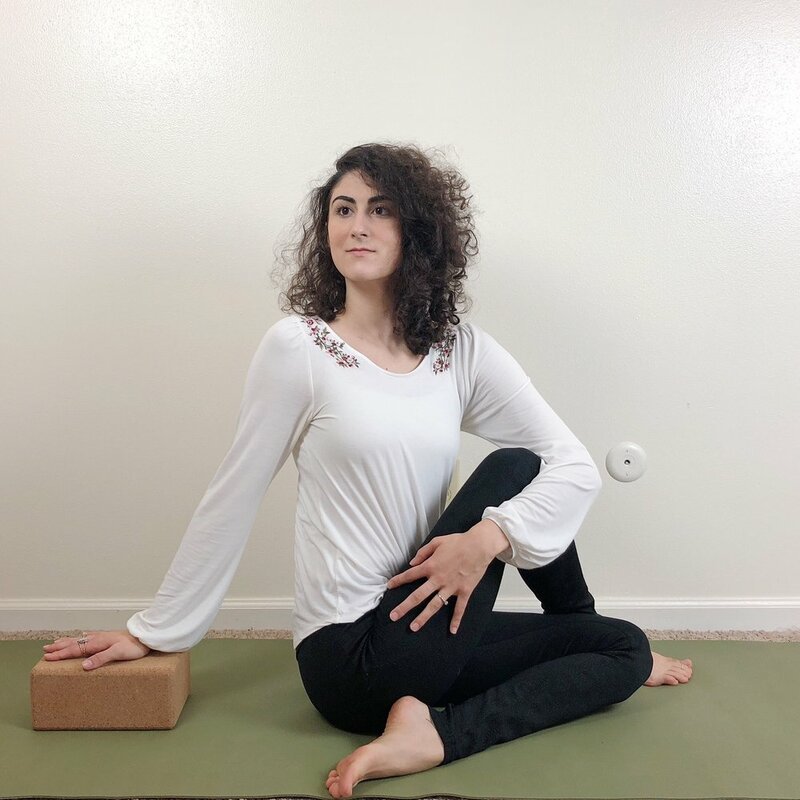 If lying flat doesn’t feel good at all, you can elevate the upper body using a bolster propped on top of a yoga block. 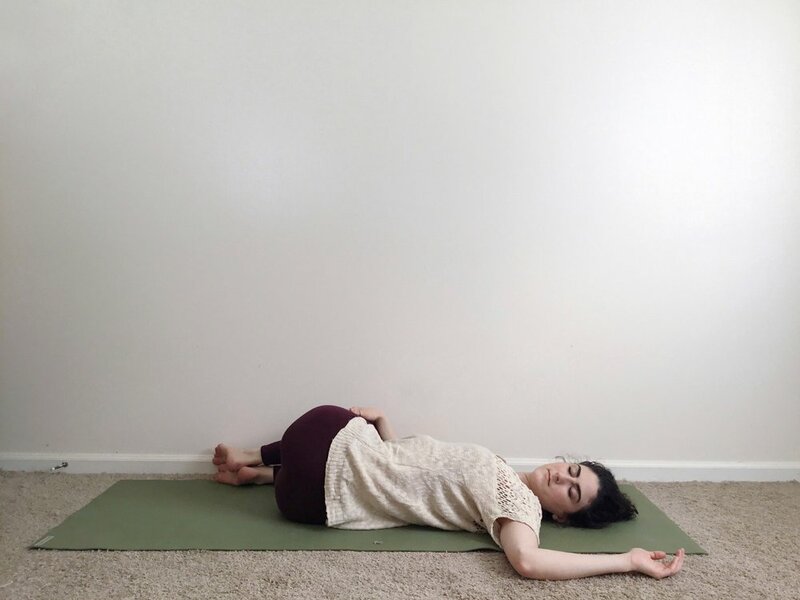 If adding a bolster doesn't alleviate your lower back discomfort, you can practice constructive rest pose instead. To come into constructive rest pose, lie flat on your back. Bend the knees and place the feet flat on the floor. Take the feet slightly wider than hip distance apart and let the knees fall in toward one another. The arms are extended alongside your body with the palms facing up. Hold this variation for as long as you like. As the name suggests, for this pose, you'll lie on your side with the knees slightly bent to create length in the lower back. You can bring a pillow between your knees and a pillow under your head to keep your spine and hips in alignment. I also like to bring a bolster behind my back in this pose to feel extra safe and supported. You can also bring a pillow in front of your body and rest your top arm on it. If lying down still doesn’t feel good, you can be seated in a chair with feet flat on the floor and the ankles directly below the knees. Rest the palms face-up on your thighs to create the same feeling of surrender. Twists are a great way to re-energize the body and promote spinal flexibility. This can help us to reduce pain, improve posture and balance both sides of the body. I would recommend doing a twist every day if you can because they have so many benefits! The seated twist we’ll be looking at in this post has a really weird name, and I think it’s one if the poses that makes people think you need to be able to bend yourself into a pretzel in order to do yoga. But fear not, my friends! There are ways for us to modify this pose so that we can all get the benefits. Sit with your legs extended in front of you. Bend the right knee and place the foot flat on the floor. Cross the foot over the top of the left leg so that the foot is beside the left knee. Then bend the left leg so that the left foot comes beside the right hip. Evenly press into both sit bones. Lengthen your spine. Pull your belly button in, then begin to twist toward the right. Reach back with the right hand so that the palm is flat against the floor. This encourages the chest to open. Wrap the left arm around the right knee. Or press the outside of the left elbow into the outside of the right knee. Whichever position feels more comfortable for your shoulder is fine. Keep the jaw relaxed and the chin parallel with the floor. You may take the gaze over the right shoulder or keep the gaze straight ahead. Keep the spine tall and the chest proud as you breathe here. You may feel your hips shift a little bit to accommodate the twist. This is okay as long as the sit bones are still evenly rooted to the earth. Remember that you don’t need to force the twist as deep as you possibly can. Bring yourself to the place in the pose where you’re experiencing sensation but can still breathe deeply. Hold for 5-10 deep breaths on the right side, then practice on the left side. If you have sensitive knees, it might feel better to straighten the bottom leg. Otherwise, the same alignment tips from above would apply. Hold for 5-10 deep breaths and then practice on the opposite side. Keeping your gaze straight ahead is recommended for stroke survivors and for those of us who may have neck pain or cervical instability. If you’re hand doesn’t reach the floor, you can place a yoga block or folded blanket under the hand. Being able to actively reach the heel of the hand toward the floor will encourage your shoulders to open and is also energetically grounding. If bending your legs into this pretzel shape doesn’t feel good, that’s okay. A simple seated twist is just as beneficial. You can do this on the floor with the ankles crossed or seated in a chair with both feet flat on the floor. Feel free to elevate your hips with a cushion or folded blanket so that the hips and knees stay comfortable. Keep both sit bones rooting into the earth as you lengthen your spine. Pull the belly button in and twist to the right. Reach back with the right hand and gently grasp the right knee with your left hand. Hold for 5-10 deep breaths and then practice on the left side. Be seated in your chair at the edge of the seat away from the back. Place the feet flat on the floor. From here, you may lift the right foot and place it on top of a block or you may cross the right knee over the left. Root the sit bones into your seat and lift through the crown of your head. Pull the belly in and twist to the right. You can place the right hand flat on the seat of the chair or you can hold onto the back of the chair. The left hand puts gentle pressure on the outside of the right knee. Hold for 5-10 deep breaths, then practice on the opposite side. If being upright isn’t an option for you right now, you can choose to do a supine twist instead. You’ll still get the same benefits. To come into the seriation, lying on your back with the knees bent and the feet flat on the floor. Present to the soles of your feet and shift the hips slightly to the right. Keep the shoulders pressing into the earth as you drop the knees over to the left. Extend the arms into a T position to open the chest and keep the shoulders rooted. Rest here for ten deep breaths and then practice on the opposite side. 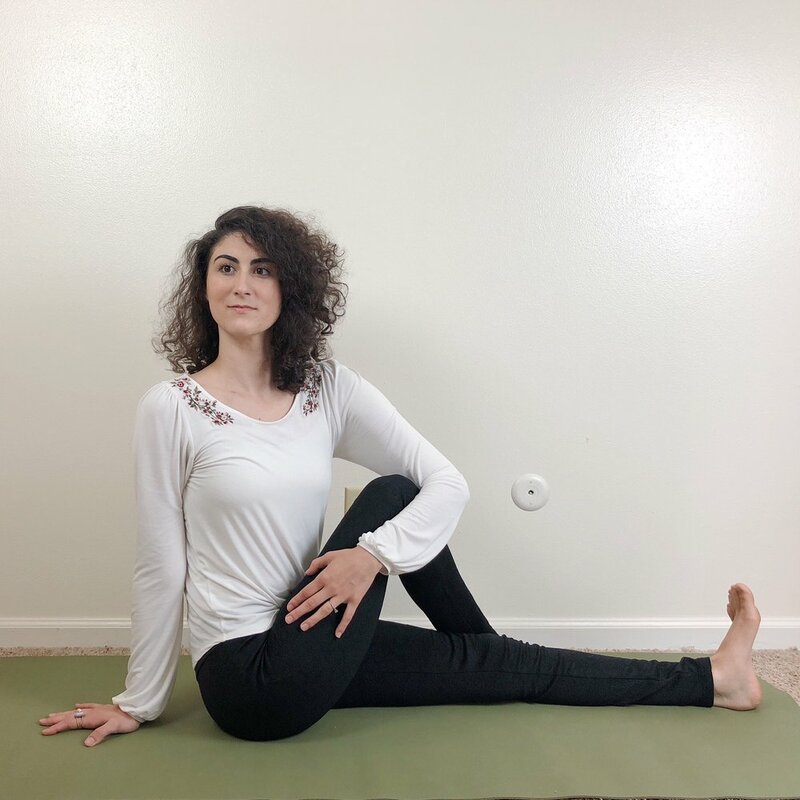 If you’d like a deeper stretch, you can practice this pose with one knee crossed over the other, alternating the top leg when you switch to the opposite side. Not everybody likes child’s pose. For many people, child's pose is a favorite. It's restorative, restful and cozy, and it can relieve pain and anxiety within the space of a few breaths. But it isn't that way for everybody. As a yoga teacher, I have seen many students struggle to get comfortable in child's pose. 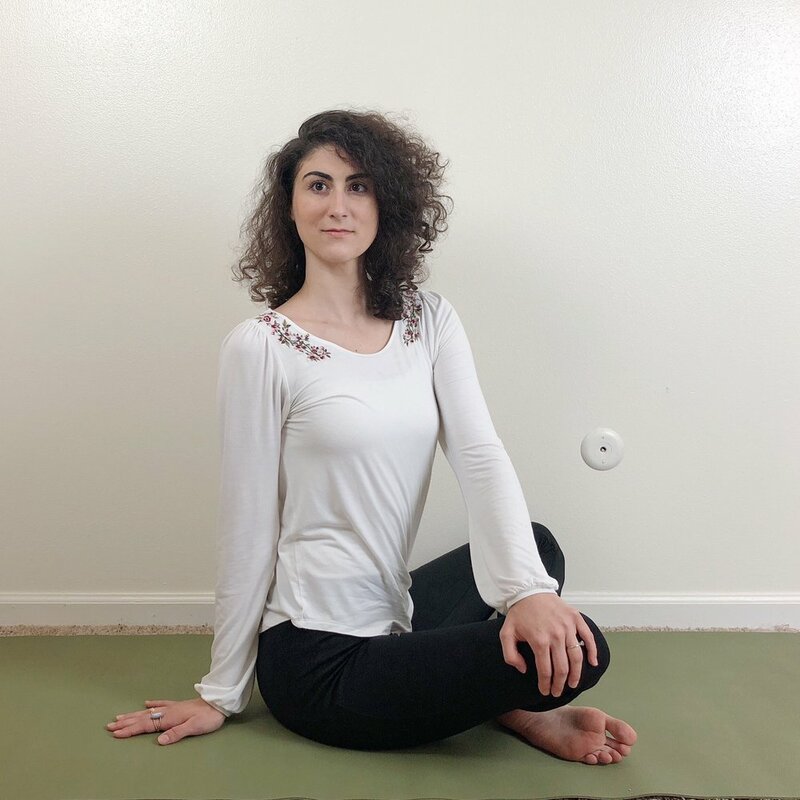 Most people see child's pose as an easy pose that anybody can do even if it's their first time on the mat, but the reality is that some bodies just don't like the traditional shape of child's pose. Some bodies just don't want to bend that way, and that is perfectly okay! We shouldn't have to modify our bodies in order to fit the shape of our yoga practice, but rather our yoga practice should be modified to fit the shape of our bodies. There is nothing wrong with you if you don't like child's pose! But because this pose comes with so many benefits, let's explore some ways to make this pose more accessible. You can still get all of these amazing benefits with the modified variations of child's pose below. Come down onto your hands and knees. Bring the big toes to touch. Knees can be together or apart, depending on your comfort. Taking the knees wide does give more space for the belly to expand with breath. Walk the hands forward, reaching the arms straight out in front of you and draping your upper body over your thighs. Let your forehead find the floor. Take a big breath in and exhale, completely relax your entire body. Stay here for ten deep breaths or up to three minutes. Supported variations can be held longer. Start by coming down onto your knees. If you'd like, you can also place a folded blanket or cushion under your knees and under your hips for extra padding. Take your knees wide. Big toes touch. Bring the bolster between your knees so you can drape your entire torso over the top. These props help to correct the most common problem I see in child’s pose: booty floating way up in the air. Once you’re settled in, turn your head to one side. You can rest here for up to ten minutes. Just make sure that you turn your head to the opposite side halfway through so your neck doesn't become stiff. For this variation, you will need a bolster and a yoga block. Lie down on your belly on top of the bolster. Stretch your legs out behind you, and rest your forehead on the yoga block. The arms can be bent with elbows under shoulders or the arms can be extended. 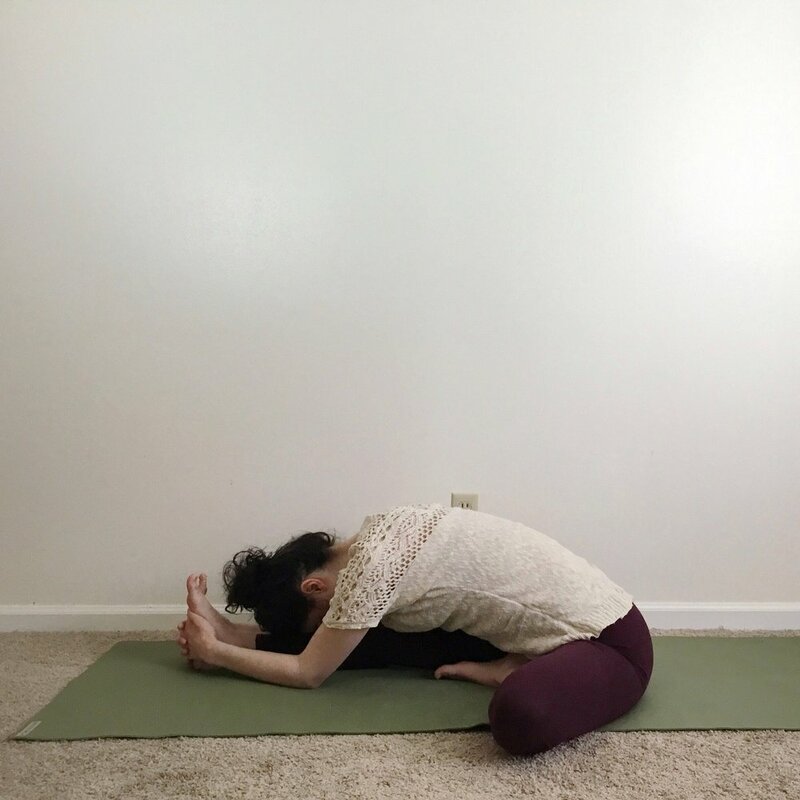 This option is great for people with knee pain or neck pain, and it still gives you all the benefits of traditional child's pose. You may rest here for as long as you'd like. If getting down to the floor is a no-go for you, you'll love this third modification! This option uses two chairs facing each other, a yoga bolster and a yoga block. Sometimes we just have to get a bit creative! To come into the pose, be seated in a chair with the feet flat on the floor. If they don't reach, use blocks or books to bring the floor to you. Set your block on the chair in front of you and place one end of the bolster on top of the block and the other end between your knees. Make sure it's secure and then drape your upper body over the bolster. You can rest here for up to ten minutes. But again, make sure you turn your head the opposite direction halfway through so your neck doesn't become stiff. I hope this pose helps you feel relaxed and supported. You deserve it! If you'd like to see how to set up and execute these poses, play the video below.